Jaguar MkVII saloonThe Mark VII saloon introduced in 1950 laid the foundations of continuing prosperity for the Jaguar Car Company. It was the culmination of years of development and was designed to sell in larger quantities than the XK sports car, at approximately 100 per week compared with the XKs 60. The principal reasons for its success were that it was extremely good looking, it could carry up to six passengers in comfort, and it was very fast. In fact it was the Mark VII that introduced Jaguars Grace, Space and Pace slogan. This magnificent saloon received a rapturous welcome when it was unveiled at the London Motor Show and soon after in New York to the American public. It sold well on appearance and a performance that had been confirmed by the XK120. It was competition success though that would boost sales even more. Early in 1952 two Frenchmen Ren Cotton and Jean Heurteaux would finish fourth and sixth in the Monte Carlo rally, which was the most important in the international calendar at the time. In the 1953 Monte Carlo rally, the Appleyards, who normally drove an XK120, came within a second of winning the event, with Irishman Cecil Vard fifth in his Mark V saloon. 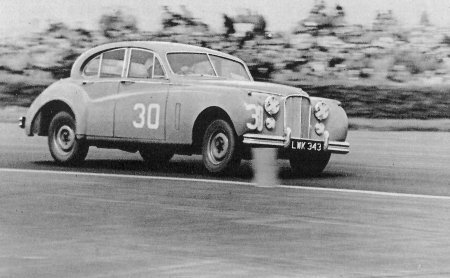 In the Silverstone Production Car Race, which was open only to saloons, Stirling Moss won in both 1952 and 1953 in a Mark VII.